Dropped from an airplane through a storm of burning lead, sucked into the head deep waters of a flooded field, pushed through the thickets of the bocage in search of his fellow fighters, comes a man to help liberate a continent from evil. Like many of us, I got a better appreciation of the heroics and sacrifices of U.S. airborne troops through the mini-series Band of Brothers. 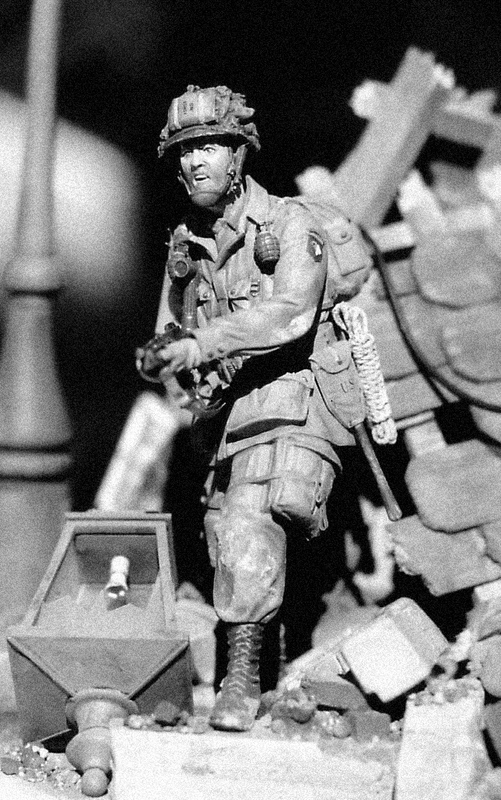 This 120mm figure from Verlinden, "Easy Company 101st Airborne Thompson Gunner" (1788) is my second large scale figure, following DML's 1/16 101st Airborne figure. I'm still trying to get that figure's Mohawk-shaven head to look right, but I think I did a respectable job on this one. I hope it will help give some pointers to those of you building airborne figures of any scale. Verlinden's kit is very nice, while benefiting from some enhancements. It comes with a small base, but being a diorama guy I wanted to give a stronger visual sense to the presentation. As I built this in the weeks leading up to the 60th anniversary of the launch of the liberation of France, I decided to use the base to help symbolize and honor that effort. Even the name of the piece was chosen to underscore this theme. Click on the photos with borders for close-ups of the subject.